The New Zealand Fur Seal was hunted near to extinction until its protection in 1894. Now the species has completely recovered and there are several healthy breeding colonies or rookeries around the New Zealand Coastline. The impossibly cute seal pups are born in late December early January and are weaned from their mothers milk by July / August at which time they head out to sea, only returning occasionally. The New Zealand Fur Seal colony at Cape Palliser is the largest in NZ. New Zealand Fur Seal, Arctocephalus forsteri, pup at the Cape Palliser Seal colony, Cape Palliser, Wairarapa, North Island, New Zealand. 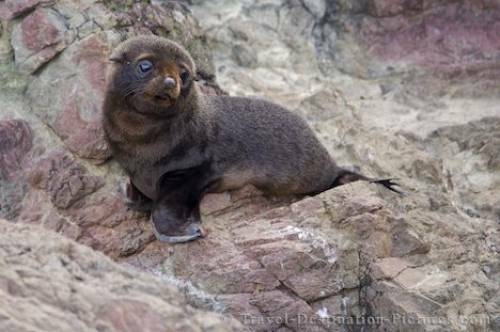 Picture of a cute New Zealand Fur Seal Pup on the rocks at Cape Palliser on the North Island.